Place the tomatoes, garlic, onions, and chile on a medium baking dish, roasting pan or ovenproof skillet. Place them under a hot broiler and char the ingredients for about 9 to 10 minutes, turning them halfway through as the pieces brown thoroughly. The tomatoes’ skin should be charred, wrinkled, and the juices begin to run. The chile and onions should be softened and nicely charred; the papery husk of the garlic should be burned and the clove softened inside. Remove the skin from the garlic clove and discard. Place the garlic in the blender along with the tomatoes, onion, and chile (start with half chile first, adding the other half or more if you feel you want more heat later), and the salt. Purée until smooth, set aside. In a large sauté pan, over medium heat, add enough oil to reach 1/2-inch deep; let it heat for about 3 minutes. Gently glide each tortilla through the oil, one by one, for about 15 seconds on each side, so that they soften and become resilient. You should be able to fold them without breaking them. Transfer the tortillas to a paper towel-covered plate. Alternately, you can lightly toast them on an already hot comal or skillet set over medium heat, for about 20 seconds per side. Glide the tortillas through the salsa. Fold and then cover, generously, with more of the red sauce. Sprinkle with the crumbled cheese, the cream, and the chopped onion. Another hit. I did fry ours a little crisper and cooked the sauce bc our tomatoes in MN aren’t the most flavorful right now. And that cotija cheese! My “meat and potatoes husband” said he didnt miss the meat. I couldn’t believe my ears! Making your carnitas with tomatillo salsa tnght…the house smells fabulous. I’m so glad I found you. Im asking my girlfriend for your cookbook as a b-day present. Cant wait! The smell is so amazing…glad you guys loved them! And Happy Birthday, Laura! It is such an honor that I get to share my love of Mexican food with you, Julie, and show its many flavors. You have turned me into the best cook ever and are forever my go to for recipes. Thank you!! Oh thank you so much Roberda! I have been a fan for 6 +yrs ? so much fun really good stuff. Have used many keep it UP! 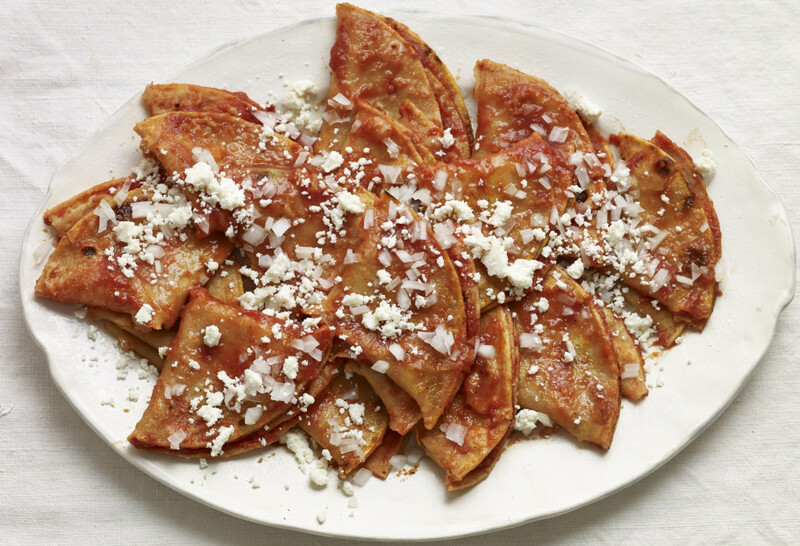 Hi Pati, Are these entomatadas rather than enchiladas? My mom used to make them. We are from Sonora, Mexico originally. Hola! Mi mama always fried the sauce (poured it into a hot pan with a little oil) to get rid of the raw tomato taste and give the sauce a more roasted flavor. Does broiling the veggies do the same? Hola Lisset, thank you for the question! You can fry this sauce as well… it is one variation on the dish. I prefer to make it as is, but you can always adapt it to your taste. Hola Pati!! These enchiladas remind me of my Tia from Ojinaga, Chihuahua. She would make theses for my sister and I whenever she would stay with us during the summer. Thank you for sharing these wonderful recipes. I can honestly say I never would have thought I would be able to make these ever, because she is no longer with us and we didn’t know Spanish. I guess the way she communicated with us was through her food ❤️. Patti, I liked your old version of your website, unfortunately I don’t like this one??? Thank you for the feedback, Mary!